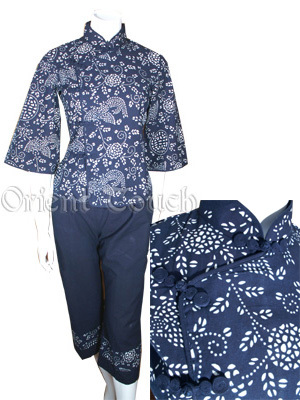 This set features elbow length bell sleeves, with traditional closure of handmade frogs and floral pattern for the top which is matched with a calf length pants for underneath. Take a break to the countryside with this delightful matching set for a cozy way to relax yourself! Bust 32?amp;quot; 33?amp;quot; 34?amp;quot; 35?amp;quot; 36?amp;quot; 38" 39?amp;quot; 41?amp;quot; 44"
Hip 35" 36" 37" 38" 39" 40" 41?amp;quot; 43" 46"